Elle's Studio NEW lines are NOW AVAILABLE! To celebrate our new items, we are doing FREE SHIPPING on orders over $50 for USA (coupon code: 50freeship) and $75 for Canada/International (coupon code: 75freeship) THIS WEEKEND ONLY. Offer expires 1/27/14. Coupon code must be used at checkout. This release includes our new Love You More and Everyday Moments collection, along with new wood veneers and four different colors of alphabet stickers! (Please note: we are running low on the wood veneers, if they do sell out, look for another restock in February). 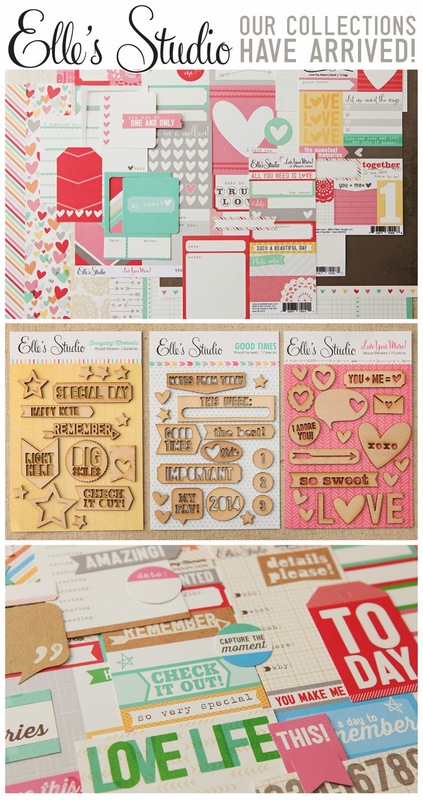 With this release, our Bits & Pieces packs have increased in size and now include tabs, frames, tiny tags, etc. Each pack includes 31 tags and work perfectly for your layouts, mini albums, Project Life, and more! 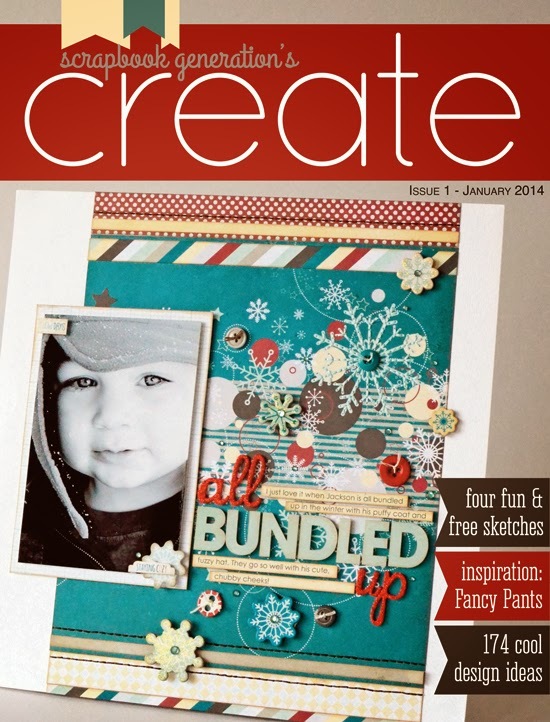 CREATE is a free monthly digital magazine published by Scrapbook Generation, a scrapbook store in Springfield, MO. The first issue, 223 pages, launched this week in conjunction with the opening of Scrapbook Generation's expanded, full-service online store. The design team for Fancy Pants Designs used four sketches by Allison Davis and Debbie Sanders, creating 43 projects featured in the magazine. Design team members provided information about using the sketches, as well as interesting tidbits about their projects. The four sketches are included in the magazine and are available as a free download to readers. CREATE also includes some fun "inside" facts about Fancy Pants Designs, the company. 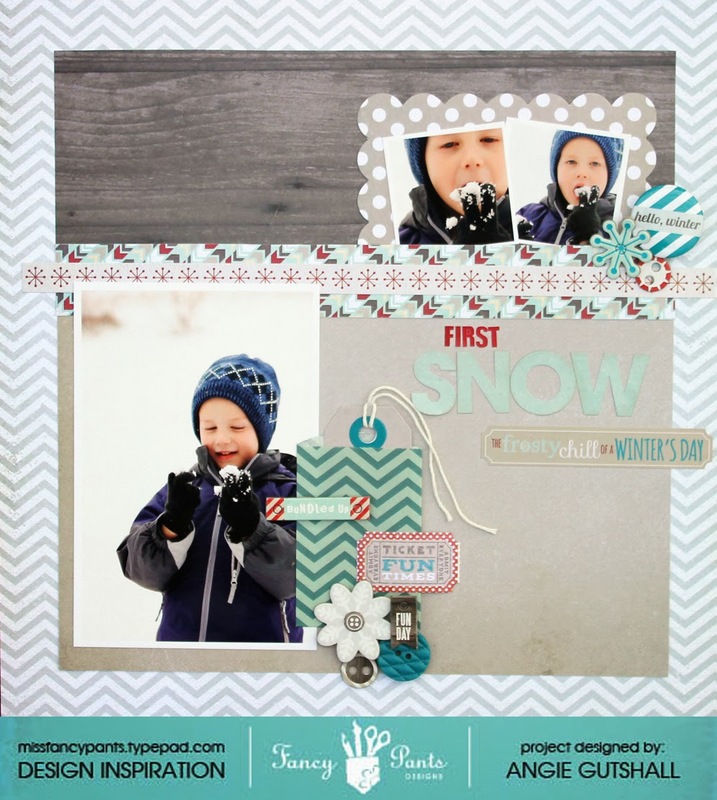 While it focuses on sketches, the magazine covers other topics of interest to scrapbookers and cardmakers, like mini-albums, journaling, techniques, and more. There is also a readers gallery and a call for submissions for the March issue. Here is my layout you will see inside this issue. I used Fancy Pants Designs Timbergrove collection. I created this layout using the Elle's Studio Noel line and also the December Kit. I also used a sketch from Dec. The sketch was based off a layout from Corrie Jones, I love her work! This is the picture I used for my Christmas card.